Nick Agar is an award winning woodturning artist and has a well-earned reputation for producing highly individual, beautifully crafted art from his riverside studio in Devon. With more than 25 years’ experience he has a great understanding of his medium. Nick’s work is in constant demand from collectors across the globe and he counts royalty among his illustrious clientele. Nick is a registered professional turner, a member of the AWGB and AAW, and an elected member of the Devon Guild of Craftsman. To see more of Nick Agar’s wonderful work visit his website. 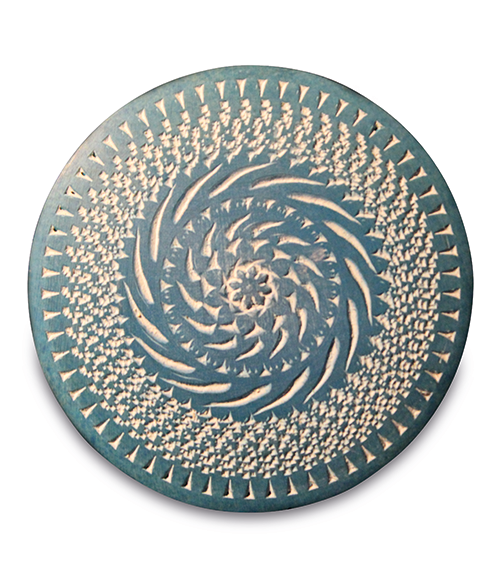 This example finished in blue uses the medium cutter for the modular micro spiralling tool. Nick achieves what appears to be a complex pattern quickly and efficiently. Working away from the centre of the piece he presents the teeth of the cutter at different angles to achieve the varied designs. 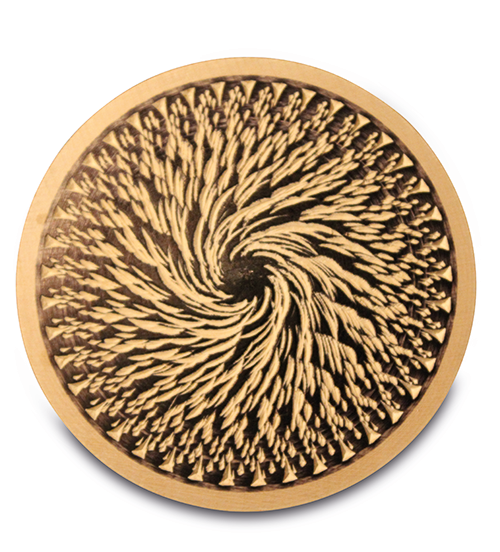 This black finished starburst-like swirl was created using the full sized tool with the 4mm pitch cutter. Start in the middle, but unlike the varied patterns in the red and blue examples where designs are achieved by holding the tool in place; use a sweeping action whilst simultaneously presenting the tool at an open angle as you work towards the rim. 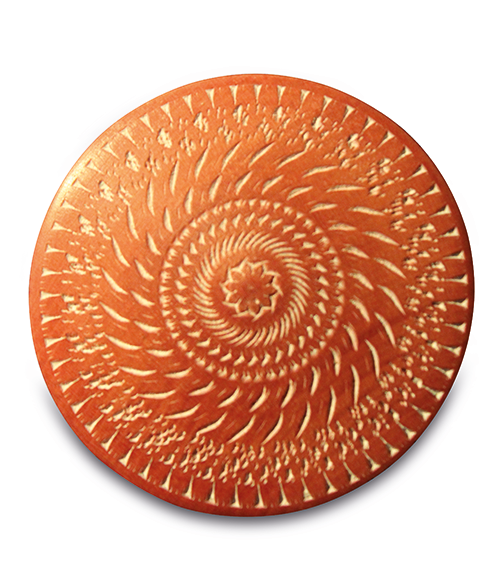 The full size spiralling tool was used to create this beautifully patterned example finished in red. The centre flower-like design was created using the 2mm cutter, while the patterns working their way to the outside were used with the larger 4mm pitch cutter. Hold the tool steady to create each pattern, the difference in the pattern being the angle at which the tool is presented to work. 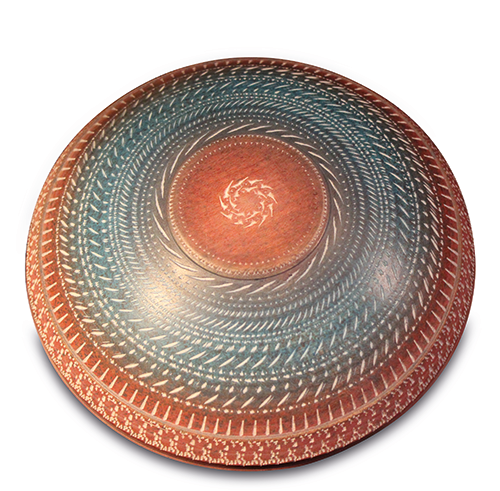 To create the multiple patterns represented on the underside of this beautiful bowl, Nick uses a blend of the tools and techniques. Here the medium and fine cutters of the modular micro tool are combined with the full sized tool’s texturing wheel and a further three spiralling cutters at 2mm, 4mm and 6mm pitches to create the variegated design. For even more information on tool usage, advice and questions, join our forum. For information about our vacancies, Click Here. 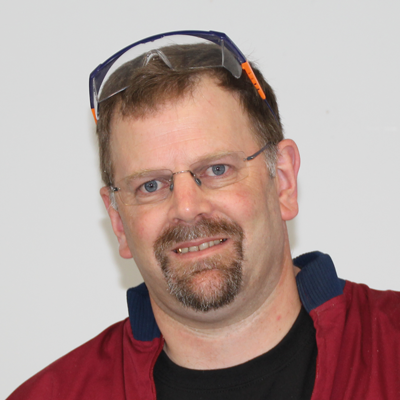 Connect with us on social media to keep up to date with all the latest tools, tips and woodturning techniques. We have a wide range of woodturning videos available on our YouTube channel. © 2018 Robert Sorby. All Rights Reserved.